Back in the 1980s I played guitar. Yes, I’m that old. I learned from books and by playing along with CDs, and I jacked my Charvel guitar (awesome) into a Session guitar amp (terrible), and I never really got any better. Now, 30-odd years later, I’m at it again. And like most things, except mobile phones, everything is better than it was in the 80s. Mid-range and even low-end guitars are better-made and cheaper. Amps are cheap and no longer terrible. And we have iOS devices and apps which can replace whole suitcases full of effects pedals. 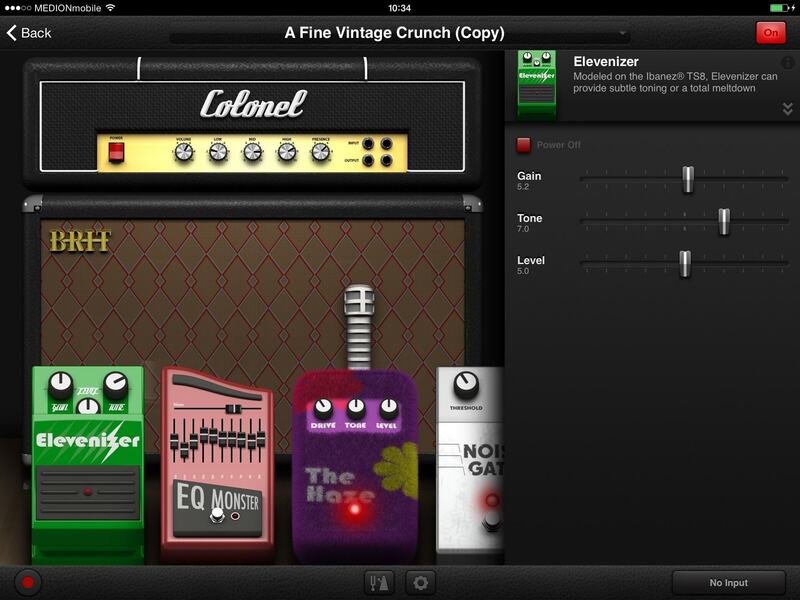 That’s what we’re looking at today – iPad (and iPhone) guitar amp simulations, along with virtual effects pedals. And along the way, we’ll look at hardware to connect up your guitar to the iPad, and at some speaker options so you can actually hear yourself play. Spoiler alert – the guitar world has taken a big turn towards the awesome. What Is an Amp Sim? When you plug an electric guitar into a guitar amplifier, it doesn’t just make things loud: It adds its own character to the sound. The vibrating strings slice through a magnetic field created by magnets in the guitar’s pickups, and create a current. This travels through the guitar’s output jack, down the cable and into the amplifier. If you crank that amp up loud, then things start to get dirty. The broken-up, distorted sound you get when you overpower the tube/valves in an old-time amp are what makes the electric guitar sound like an electric guitar. These days, amps have a “gain” knob, which controls a “pre-amp.” This is a smaller amplifier circuit that pumps up the signal up before feeding it to the main amp section, letting you overdrive the main amp easily. This gives more control over the crunchy distorted sound, and lets you get those filthy tones without winding the volume of the main amp up to 11. That’s real-life tube amps, the kind that have been around since guitars went electric. Now there’s another option – simulation. Computers like the iPad and iPhone run software that models the actual circuits of classic amps. Apps like Positive Grid’s Bias (Universal) allow you to design the amp from the inside, but most of these apps give you a selection of software amps based on real-life boxes. And the results are incredible. My setup. Its about as portable as you could ever get. Why use an app instead of a real amp? Two reasons. Price, and space. 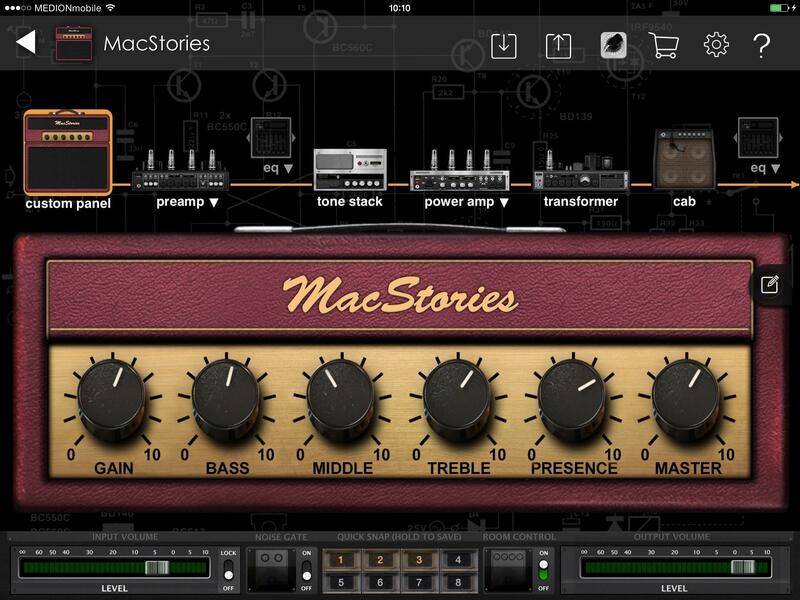 These apps run from around $5 up to $20 and include a whole studio full of amp models, whereas a single real-life amplifier costs hundreds or thousands of dollars. 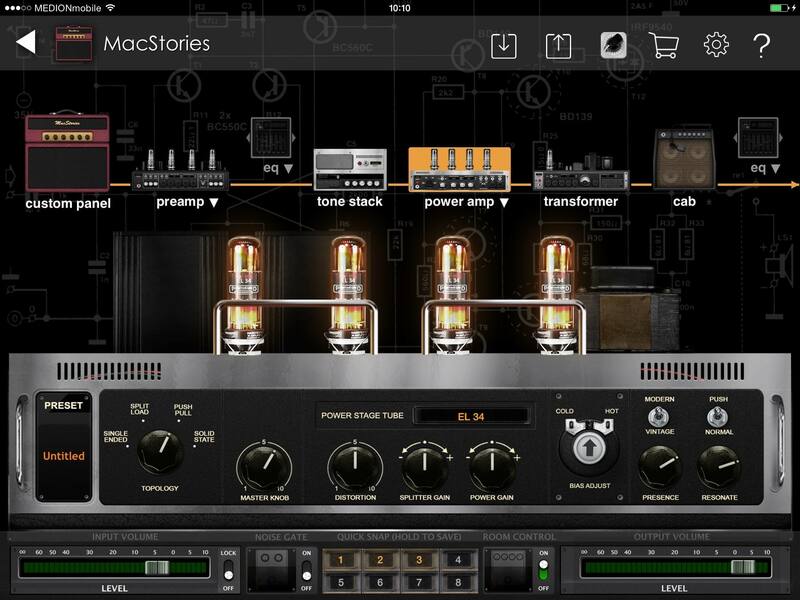 And almost all of the apps will sell you more models of amps and effects via IAP, although this can get expensive fast. Wait, effects? Yes. Almost all of these apps come with a flight case full of virtual effects pedals. In real life, guitarists modify their sound (“tone” in guitar language) by chaining effects pedals together, between the guitar and the amplifier. The apps let you do the same thing, only instead of paying $100 a pop for pedals, they come in bundles for around $5, or seperately for few dollars each. You’re playing so quiet that you can hear the strings of your guitar at the same time as the speaker. You’ll notice even the tiniest delay between them. You’re using complex effects (often things that shift the guitar’s pitch introduce lots of delay). Any time the app goes crazy and you don’t know why. You’re standing up and wandering around the room. Latency is measured in milliseconds, and sound takes a few milliseconds to get from the speaker to your ears. If you’re sitting on top of your speaker, you’ll notice latency more than if you’re on the other side of the room. It sounds crazy, but it’s true. Try it. If your app seems to be running slow (and it will happen from time to time), try toggling the various latency settings (usually easy to find, although some – like ToneStack – have them in the Settings app). You can also try restarting your device, or force-quitting other apps, but I don’t find that helps very often. What does help, is toggling the app’s latency settings. If it’s set to, say, “ultra low,” then just switch it to something else then back again. Then restart that app only. This works 90% of the time for me. If it doesn’t, I use another app instead, and try again the next day. One word of warning. Lower latency settings (shorter delays) are good, but require lots of computing power to pull off. Recent iOS hardware is fine, but if you’re using an older device, it might struggle to keep up. In this case the sound may break up, or you’ll get pops and crackles. These apps mostly work in the same way. They show you almost photo-realistic versions of real-world gear on screen, and let you chain them together in the order you like. I laughed at this approach to begin with, and I still don’t like twiddling virtual knobs, but these representations of real gear make it quick and easy to find your way around without having to decipher lots of tiny text labels. Some, like JamUp, let you drag the icons around to re-order virtual boxes. Others force you to delete an effect from its slot before selecting another, even if all you want is to swap its position in the chain. All can save presets (and most let you share and download presets made by others), and some even let you switch off the amp and just use the effects. This is handy if you’re running the output into an actual guitar amp. And Bias has a special trick that makes using it with real amps better than the rest (more on that below). This is my favorite app, and the one I use the most, so I’ll use it to explain how these apps work in general. JamUp also has one unique advantage over the competition, because it works with the developer’s other app, BIAS. BIAS (see below) is an app for designing amps, and once you’ve made one, you can import it into JamUp to use, just like any other. That adds a lot of flexibility. JamUp lets you share and download amps from other users. This one is supposed to sound like Jack Whites setup. The top part shows your effects and your amp. Tap on one and you’ll see a close-up view in the bottom half of the screen. Double-tapping an effect or amp lets you browse for another unit (dimmed items become available to use after an In-App Purchase), and dragging the units changes their order. Finally, you can switch an effect on or off either with its power switch, or by flicking it up and down off the yellow line (this line represents the signal chain). This is pretty much how all the apps work, although JamUp might be the most intuitive. The drag-and-drop of effects makes experimenting easy, unlike some other apps which won’t let you do this. Jack White says that “you have to put the Whammy after the Big Muff in the signal chain,” and who can argue with that? Another feature shared by almost all of these apps is IAA (inter-app audio) and AudioBus support. The former is Apple’s native but limited version of the latter, and AudioBus itself is a neat app that runs in the background and acts like virtual cables, letting various music apps pipe their sound to each other. Thus, JamUp can not only send its own audio to GarageBand, but it can be used by GarageBand as an effect. That is, your JamUp effects can be used by GarageBand to apply to any other sound input. Neat, right? Pros: JamUp’s effects are great, and it’s one of the easiest-to-use apps here. Universal (and amazing on iPhone 6), free version available. Works with BIAS, for infinite amp models. Extras: Tuner, metronome, 8-track recorder, MIDI, sampler (like a loop pedal for repeating parts of your playing), option to use with Bluetooth AirTurn pedal, and a huge library of user-shared setups. Works with IAA and AudioBus. Also, backup and sharing of your presets via Dropbox. There’s also a music player which grabs tracks from your library so you can play along. Speaker on/off toggle (via BIAS). BIAS is in its own class here. 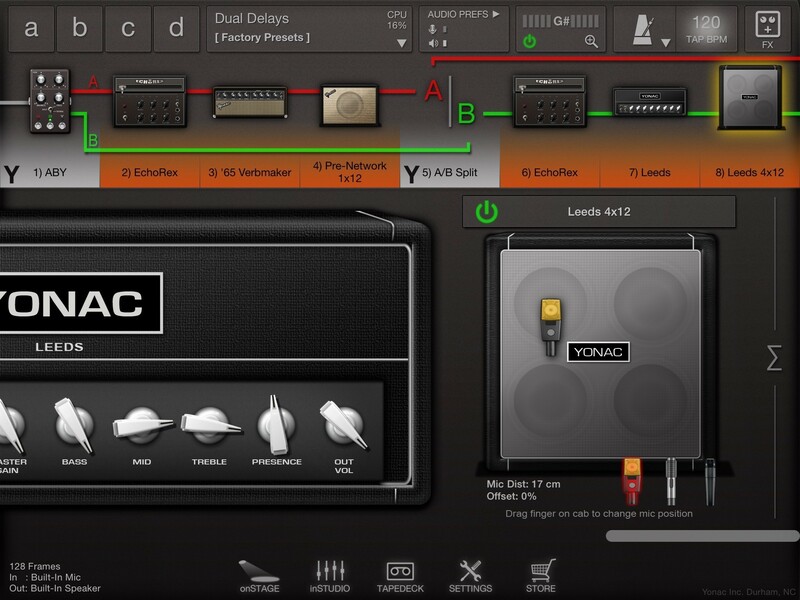 Instead of plugging in and jamming, the app is really meant for designing amps, which are then opened in JamUp for use. 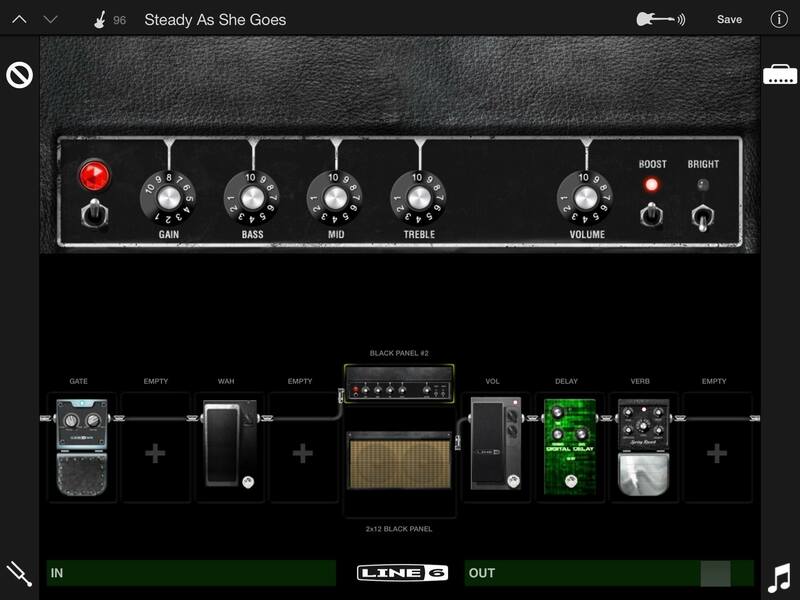 You can totally play through the amps in BIAS (it would be pretty hard to use if you couldn’t), but you don’t get any effects, and – because the app is modeling every part of the signal chain in real time – you get extra latency (even on an iPad Air). I won’t go into every feature here, but let’s just say you can go deep. You can swap out the tubes in a tube amp, choose and adjust the “tone stack” (the part which houses the tone knobs), you can tweak the transformers in the amp (!) and even design the front panel (like I did for the screenshot at the top of this post). Not impressed? What about choosing a speaker? Not only that, you can choose which virtual microphone is put in front of that speaker to capture its sound, and you can place the mic in 3D space to affect the sound and to capture room reverb (you can also adjust the shape of the room). Which brings me to a neat trick. If you’re planning on running your setup through a real guitar amp, then that amp’s speaker will add its own color to the sound. My tip is to switch off the virtual speaker in BIAS, otherwise things get a little muddy. Do this by tapping the “cab” section at the right of the signal chain in the BIAS editor, then tap the “cabinet model” popover and choose “bypass” from the top of the list. Then open it up in JamUp (tap the JamUp icon) and enjoy your creation. I have a bank of presets over in JamUp labeled “no speaker,” just for this scenario. Finally, you can share and download zillions of amps from the BIAS Tone Cloud. Pros: Absurdly customizable. The sounds that come out of this thing are amazing. Comes on the iPhone too, which is just crazy. Extras: Adjustable everything. Works with BIAS desktop app which will model real amps just by listening to you play through them. Nerdy fun. Pairs with JamUp for an unbeatable combo. Speaker on/off toggle. AmpKit was my first love, before I was seduced by JamUp’s draggable effects. 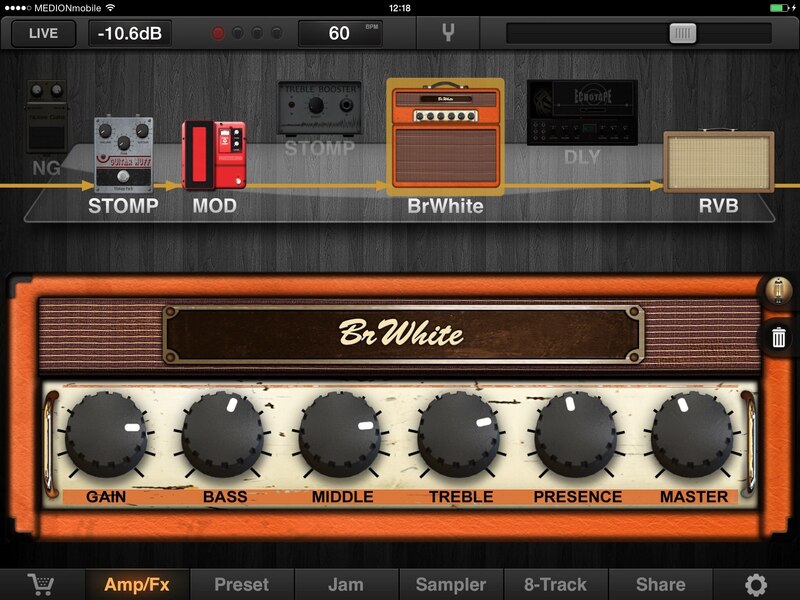 Like the other apps, AmpKit lets you switch amp models and add effects pedals. 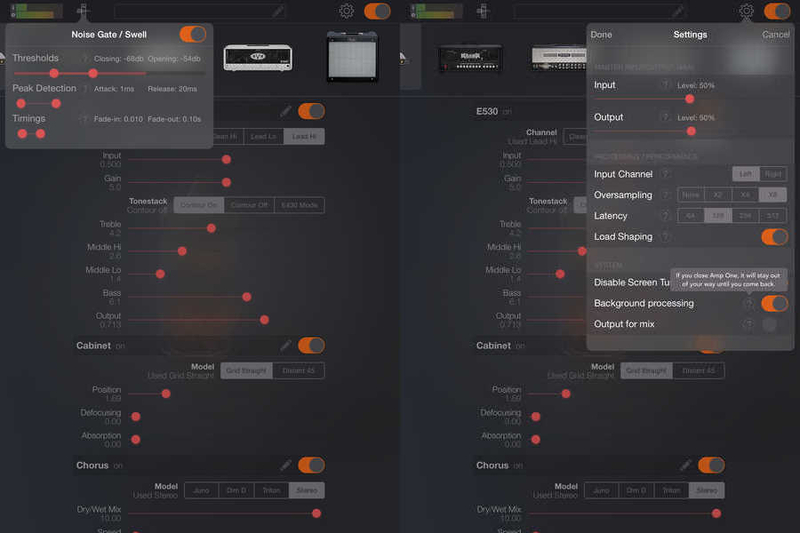 Unlike JamUp, AmpKit lets you mix-and-match amps and speakers, and also lets you choose a microphone, and the mic’s position. The interface is a little different. Here you tap on an effect, speaker or amp and then adjust its parameters in a control panel on the right. I prefer this panel to tweaking virtual knobs on a screen, which gets old fast. What I don’t prefer is that I can’t drag pedals to re-order them. Instead, you have to tap on the pencil icon to enter edit mode, then reorder the pedals in a list view. AmpKit sounds great, and has a ton of amps and effects. It also has a great feature in its in-app store - you can preview effects as you shop. The store also tells you the real-world pedal or amp that’s being copied, which is handy. Pros: Great sound, huge catalog of effects and amps, beautiful interface, proper sliders for controls instead of stupid tiny knobs. Extras: Tuner, metronome, AirTurn, included backing loops so you play along, MIDI, set lists (handy for quick-switching setups when playing live). Test out your setups by choosing one of the sound loops as an input, instead of having to strum your guitar. Speaker on/off toggle. Amplitube is the only one of these apps where I’ve stuck with the free version. It’s not bad, but I find it too annoying to buy. Mostly I don’t get along with the interface, which might be my problem, not the app’s. But I also don’t like the way that the app, like all IK Multimedia apps, is constantly begging you to buy things. It’s especially annoying to have the interface frozen by an IAP pop-up because you hit the wrong button in the middle of playing a song. Amplitube, nickel and diming me once again. The important part, though, is the sound, and AmpliTube works fine there. Amps and pedals are switched by tapping on popover menus, whereas speakers and microphones are toggled just by tapping them to cycle through the options. Amplitube also features an 8-track recording studio (it’s an IAP, and you’ll be reminded of this every time you accidentally hit the button to access it, which will be often). 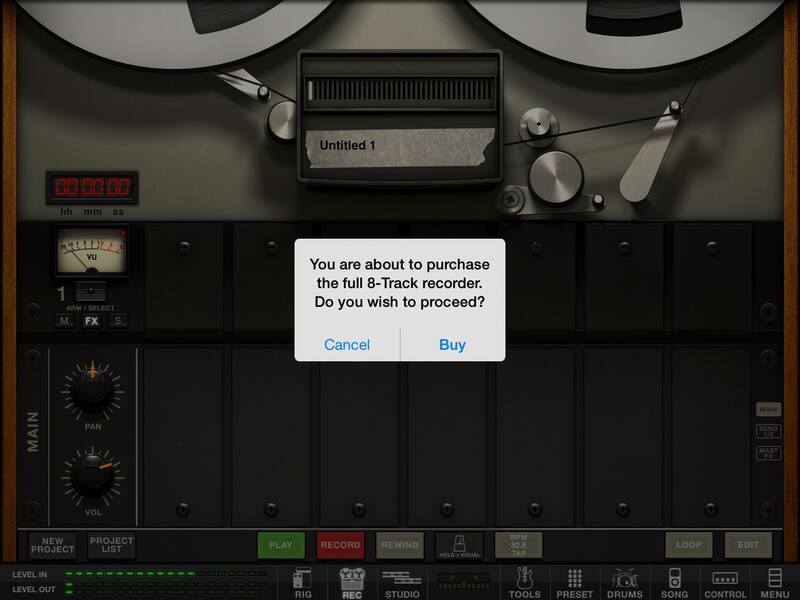 You can also record to a virtual tape machine, and enjoy the drum-loop creator, which is actually quite excellent. The Loop Drummer lets you create and play along to some great backing loops, and has a powerful editor (although too many controls have been crammed into too small a panel). It comes with a set of rock loops, but as soon as you try to access other loops, up pops the dialog asking for more money. To be fair, I’m using the free version, so I see these pop-ups more often, but they are so annoying I refuse to give the developer any more money. Pros: It sounds pretty good, I guess. Extras: Tuner, metronome, AirTurn, Loop Drummer, recording studio, tape recorder. 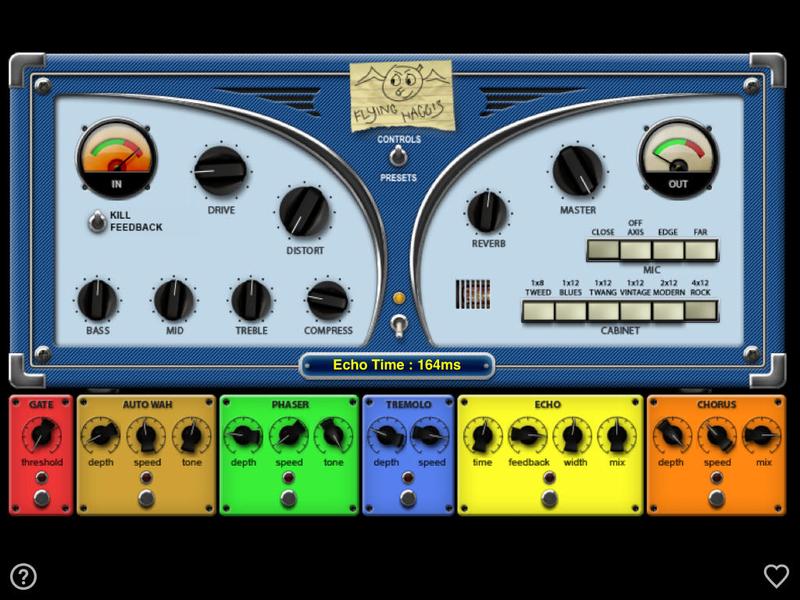 ToneStack is my other favorite amp sim, and a recent update gave the effects a brush-up. It was already one of the best-sounding sims in the store, and now it’s even better. ToneStack also has a drag-n-drop signal chain, like JamUp, but it goes one better. Uniquely, ToneStack lets you set up two separate signal chains, splitting your guitar’s signal and sending each part through different effects, and even different amps. This is pretty powerful. You can do a plain split, but you can also opt to send, say, the low frequencies along one path and the highs through another. You can also add the split at any point along the chain, so one amp can drive two speakers. Yonac, the developer of ToneStack, has a neat take on effects too. While some pedals are straight simulations or real models, others take the underlying circuitry and improve on it. For instance, the Wanger. The Wanger is a copy of the Whammy pitch shifter. The problem with the Whammy is that its controls are rather tricky to decipher and use. So while the Wanger works the same on the inside, the controls have been tweaked to make it way easier to use, while allowing you to do things you never could with the hardware version. The factory presets are also worth a mention. They’re coyly named for the songs they emulate, like Pigs & Other Animals and WahWah Chile. They sound great too, so you can play along with your favorite songs. Pros: One of the best-sounding apps out there. Easy to use. Great effects, plus that split-able signal chain. Extras: Always-on tuner, metronome, MIDI, tape deck (for playing songs and looping them), 8-track studio (the first 2 tracks are free, then the annoying pop-ups start) and that unique signal-chain splitter. Speaker on/off toggle. MobilePod is Line 6’s companion app to the Sonic Port guitar interface, and if you use it with the Sonic Port, the app is free. As in, you get all the effects and amps included, with no more purchases necessary. If you use different hardware to get your guitar signal into the app, then you’ll have to pay $20 to unlock it, but then you’re done. I like this deal, but then I would, as I own the hardware. The Mobile Pod signal chain puts the amp in the center, with effects slots lined up before and after. The design is minimal, which is nice after all these graphics-heavy apps, but there’s no drag-n-drop, despite enough space to make this seem like an obvious option. Instead, you need to double tap to select the effect you want to change, then tap a button at the top right of the screen to enter the selection page, then pick an effect to replace it. If all you want to do is switch the positions of two pedals, you have to do this twice. And guess what? The knobs all get reset, so you have to start over. Mobile Pod isn’t really about effects, though. Line 6 is an amp company, and so it’s the amps that really shine here. You can mix and match amps and speaker cabinets, and they sound fantastic. There are no mic options, but you can use an amp without a speaker (like with BIAS, ToneStack and AmpKit). Pros: Minimal UI, fantastic-sounding amps, no nickel-and-diming in-app purchases for gear – it’s all included. Extras: Tuner, minimal iTunes music player, access to CustomTone tone sharing site, plus a neat feature where you can play one of several guitar loops through the effects chain. This is for non-Sonic-Port owners to try before they buy, but is also great for auditioning presets. Speaker on/off. Flying Haggis take a different approach. Instead of offering a zillion different modeled amps, it is an amp. Just like when you buy a hardware amplifier, you plug in and go. It has one sound, which can be tweaked with a few knobs and buttons. That’s not to say it’s limiting. You get a bunch of effects, several speakers, and lots of control over the tone. The point is that you spend more time playing and less time tweaking settings. I haven’t used Flying Haggis, but it gets great reviews. I would grab it right away, but when I’m in the mood to use something so simple, I just plug my guitar straight into my real guitar amp and twiddle its knobs. Pros: Simple. No in-app purchases. Extras: MIDI, AudioBus and IAA. Presets. What? Yes. 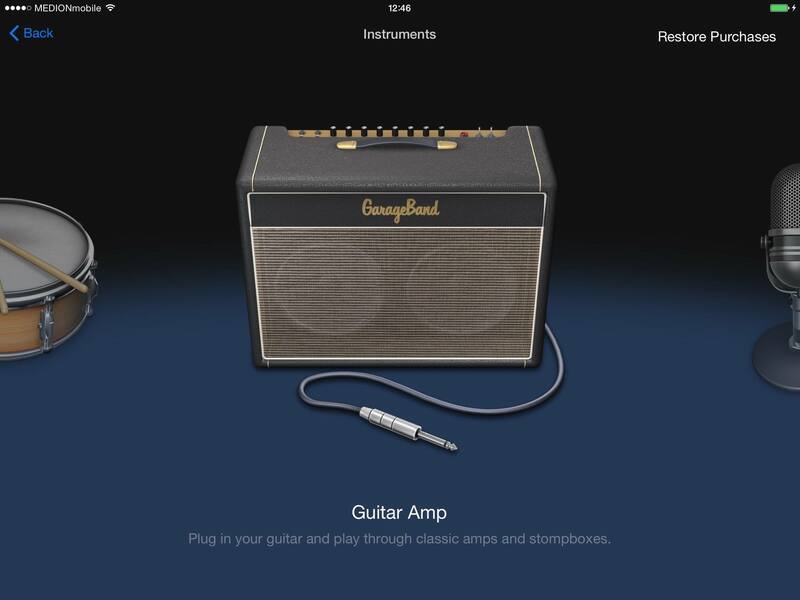 GarageBand for iOS has an option to play your guitar through a bunch of amps and pedals. Just add a track to your song, choose Guitar Amp as the instrument and you’re off. There are 32 amp models (and you can save your own presets), and ten pedals. The advantage here is that, if you’re using GarageBand to record, you’re already right there in the app. You can also use IAA to bring third-party effects apps into the mix, or jam along to Apple Loops. There’s another unique feature that GarageBand brings: Jam Sessions. You can connect several iOS devices together wirelessly in a Jam Session. Thus, you could plug your guitar into your iPhone, have someone else play keyboards on their iPad, and record everybody’s part on another iPad. The best part is that, despite it all being wireless, recordings are made locally on each device and then synced, so there’s almost no latency while playing, and the recordings all match up. Pros: You probably already have it. It’s rock solid. The quality of the sounds is excellent. Extras: Tuner, metronome, MIDI, everything…It’s GarageBand. Amp ONE’s unique selling point is that it doesn’t ape real-world gear like all the other apps here. Instead, it presents everything as sliders and toggle switches, keeping the pretty pictures for a small row of icons at the top of the screen. And speaking of the screen, Amp ONE is the only app here that can be used in portrait orientation. It’s also one of only two sims I haven’t tried yet (the other is Flying Haggis), but it gets good reviews, and the $10 price includes everything, including all the effects, so it works out pretty cheap. 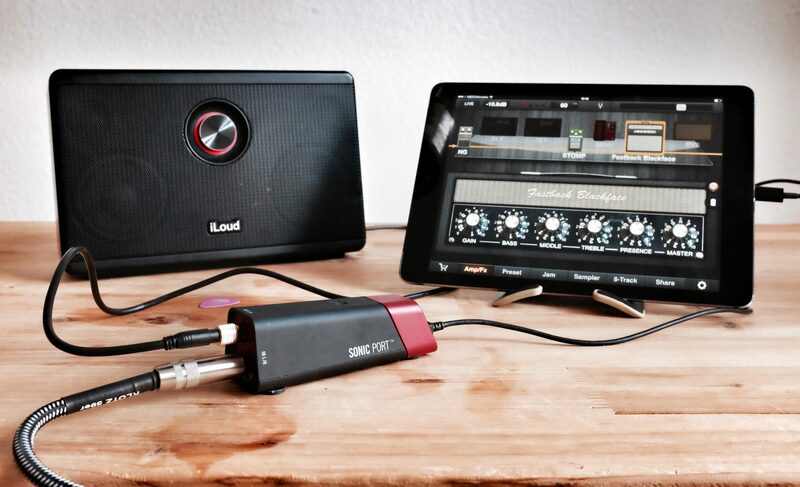 The simplest way to get started is to buy a cheap jack adapter like the iRig. It’s a cylinder with a big jack socket on one side for your guitar, a small jack plug on the other side that plugs into your iOS device’s headphone socket, plus a headphone socket for headphones or a speaker. It costs less than $20, and gets the job done. The problem is, it’s all analog, and everything goes in and out the iDevice’s headphone socket, creating interference. Far better are the digital interfaces, which connect via Lightning or 30-pin plugs. They’re more expensive, but they sound way, way better. They have their own downside, though – they use the Lightning port, so you can’t charge your iPad or iPhone while you play (although one device, the Peavey AmpKit, does offer pass-through power). I haven’t used them all, but lots of research tells me that they all sound the same, more or less. It’s digital after all. Your choice, then, comes down to the extra features they bring. This is the one I picked. The Sonic Port has lots of inputs and outputs. One end is given to the Lightning/30-pin cable (both are supplied in the box). The other has two quarter-inch jacks, one in and one (stereo) out, plus two 3.5mm minijacks, one for (stereo) aux-in (keyboard, mixing desk, whatever) and one for headphones. Line 6 Sonic Port. I have one of these. Connections-wise, the Sonic Port is the best of the bunch, and I like that you can use regular full-size guitar cables to hook things up. The extra input is good for keyboards and mixers, and the headphone output is great for when you just want to play alone. The unit itself is a little larger than the rest though, so solo practise, with the Sonic Port in a pocket, mightn’t be so easy. And the Sonic Port also gets you free entry to Line 6’s Music POD app. Using that app with other input devices requires a $20 IAP. 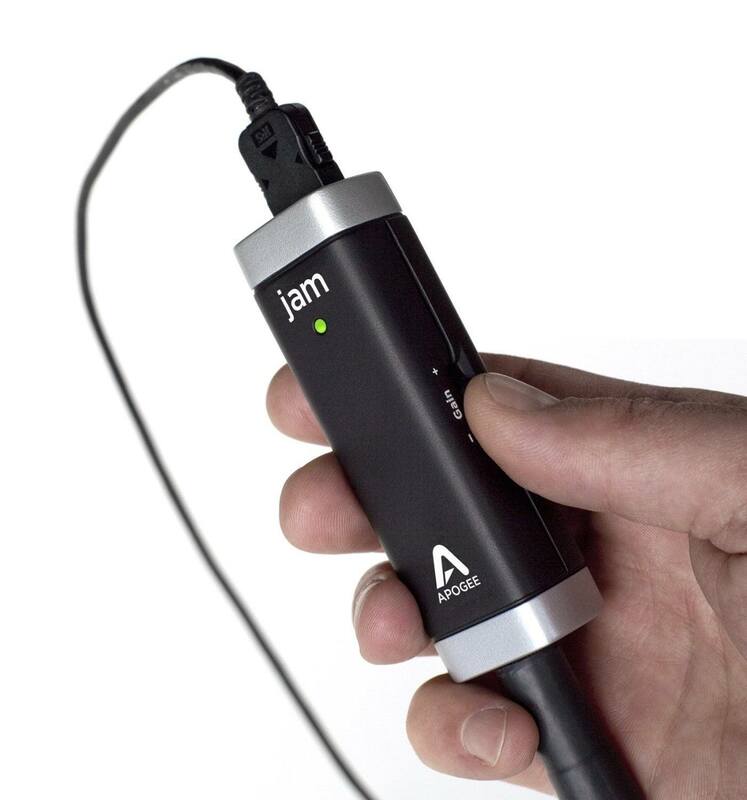 The Jam has just two holes – a jack for your guitar, and a proprietary socket for the cable that runs to your iOS device. That’s it. You also get a dial to set the input level, and an LED that tells you you’re connected, and turns red if your levels are too high. “If it turns red, you are rocking too hard and you need to turn your gain down,” says the blurb. Who am I to argue with that? One advantage the Jam has is that you can also hook it up to a Mac. Theoretically, any of these devices could be used to plug into a Mac, as they use USB and are compatible with Core Audio. But because they all use weird cable connections you can only hook them up to what they say you can hook them up to. The link above goes to the standard Jam, but there’s a higher quality version with a higher, 96 kHz/24-bit recording. If you don’t think you need such a thing, then you don’t. It’s $30 more and is has otherwise identical features. 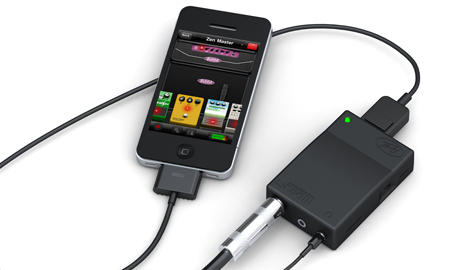 The iRig from IK Multimedia is the sister device for the AmpliTube app, but works with any of the other apps here. All these apps and devices are interchangeable, except where noted. 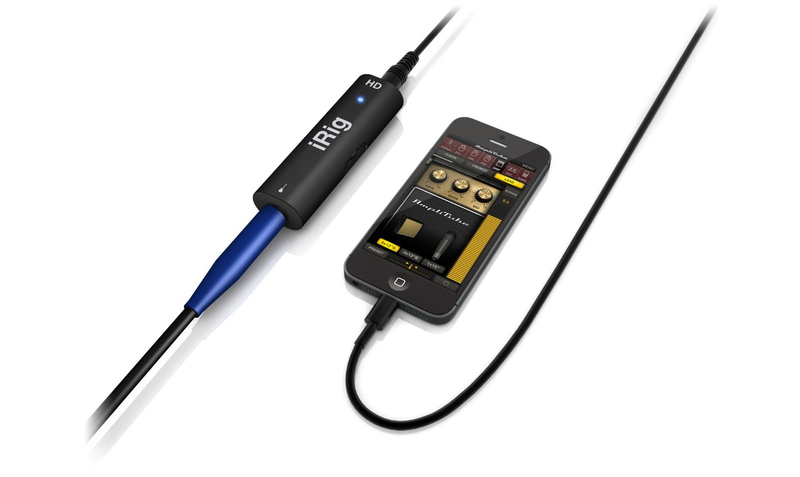 The iRig HD comes with all the cables you need to hook up to your iOS device new or old, or to your Mac. Like the Jam, it has just two ports (guitar and iOS hookup), and an input gain dial on the side. And like the Jam, it really is ideal for on-the-go use. Throw it in the bag with your guitar and a pair of headphones and you can play anywhere. Another port-fest, Peavey’s box has a guitar input, headphone output plus, a line out jack. Its gimmick is the optional AC adapter that powers your iOS device while you use it. The AmpKit Link is sold as a companion to the AmpKit app, but it works with any of the apps here. It also features knobs for controlling the level of the guitar input and the headphone output. This is a pretty useful feature, shared by a few other units here. The one problem is that it appears to be unavailable on Amazon right now, so an update may be on the way. What About a Real Amp? There’s another option here. If you like the idea of a cheap amp that can make lots of different sounds, then you can ditch iOS altogether and just pick up a modeling amp. These are essentially vanilla combo amplifiers  with a computer inside that emulates various other amp models and effects. No screens in sight. This is how I relax. The advantage here is that you can just plug in and go, and to be honest, I use my own amp (I cover it below) more than I use the iOS apps these days. Or rather, I use them together. Either way, you’re going to need a speaker to play through. I have thoroughly tested two options, so those are what I’ll tell you about here. One is a modeling amp from Blackstar, the Core ID 10, which cost me €90, and can be had in the US for $100. 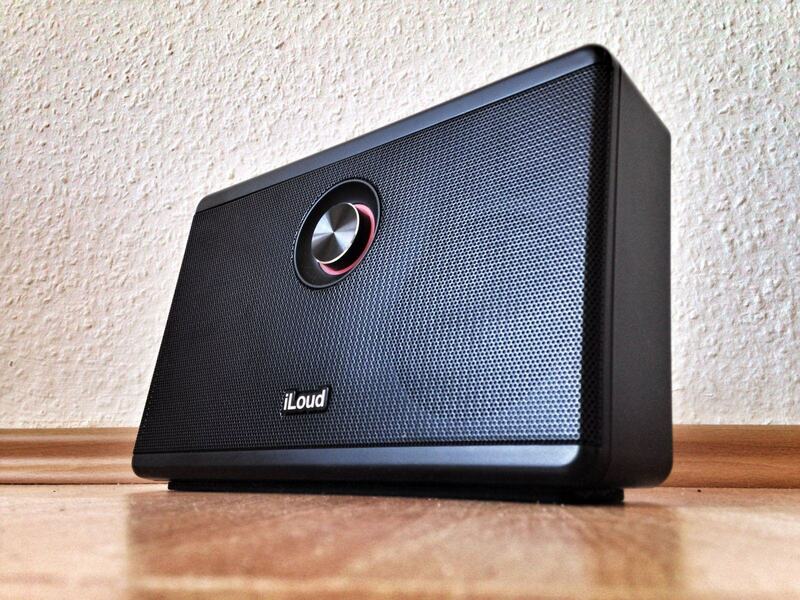 The other is the iLoud, a Bluetooth speaker designed to be used with iOS amp sims. It’s $300 list, but even at that price it’s worth it. I found this amp at my local music store after spending an hour or so trying out the VOX VT20+. As hard as I tried, I couldn’t make the VOX sound anywhere near as good as the iLoud and iPad combo I’d brought along to compare. On my way out of the store, I told the clerk that the VOX sounded boxy and cheap, so he gave me this Blackstar to test. I played it for 15 minutes before I bought it, and don’t regret the decision yet. The kicker? The Blackstar is half the price and half the size of the VOX, or other alternatives like Fender’s Mustang. So what is it? 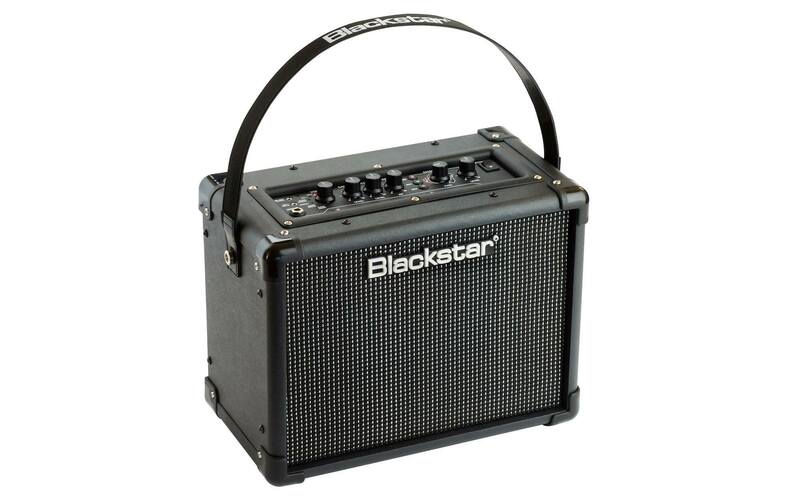 The Blackstar Core ID 10 is a little box containing a ten-watt amplifier, a pair of stereo speakers, and circuits that emulate the vacuum tubes (or valves in the UK) found in old-school guitar amps. Instead of copying the sounds of specific amps, though, Blackstar amps copy the valves themselves, using software models. On the higher-end Blackstar amps you can switch out virtual valves with a knob, but on this one you’re limited to a couple of models which are auto-selected depending on the “Voice” knob. “Voice” is a six-position control for switching between clean, crunch and overdrive sounds – from a distortion-free sound to a screaming metal fuzz. I love how the Blackstar mimics a real tube amp. Not only does it sound like one, it also behaves like one. If you roll the guitar’s volume knob down a little, the amp responds by cleaning up the sound, so you can fine-tune a just-breaking-up blues crunch right from the guitar. It also squeals and squeaks in all the right places, and gives a different response depending on how hard you hit the strings. Combine this with the stereo speakers and their “super-wide” sound processing, and you get something that sounds and feels amazing, even at low, neighbor-friendly volumes. There are also 12 effects, and a neat EQ dial called ISF. This dial changes the sound to mimic “American” or “British” amplifiers. That is, Fender on the left and Marshall on the right, with VOX somewhere after noon on the dial. It seems gimmicky, but you can really change the sound of the amp with this dial. I can turn it all the way to Marshall (fittingly, this is the ten-position on the dial, although I’ve used a marker to change it to eleven), set my gain dial to 3 o’clock, switch to my Telecaster’s bridge pickup, and play Aerosmith’s Walk This Way. My playing sounds terrible, but the amp sounds awesome. 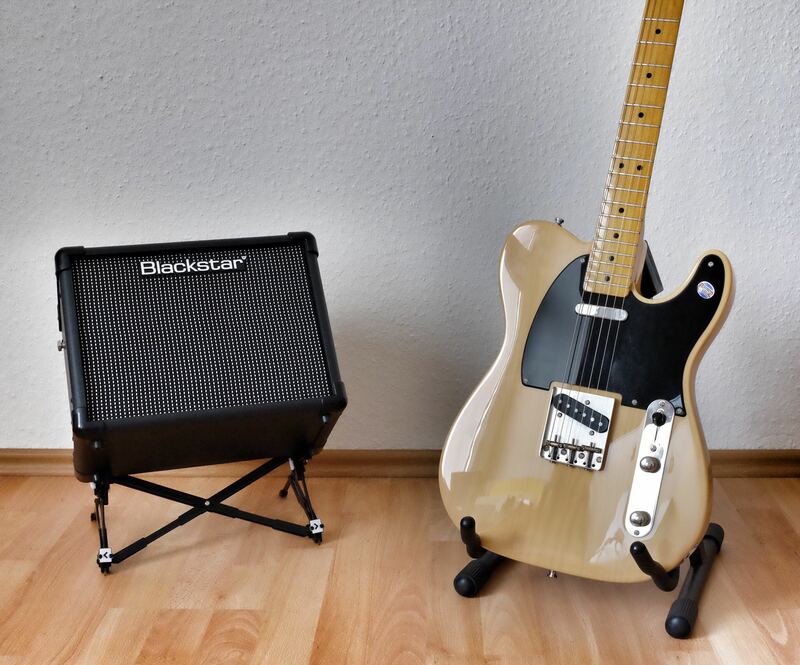 In fact, while I was writing this article, I spent some time in the BIAS app searching for a modeled version of Blackstar amps so I could get the same sound from my iPhone and headphones. There are other nice features: a USB port lets you load in new presets (via some truly horrible Silverlight Mac software), and also tweak some extra settings. The USB port also sends sound to a Mac or iDevice (using a camera connection kit) for recording, and allows for firmware updates. There’s also a line-in jack for playing along to songs, and a headphone jack, which gives an “emulated out” signal. That is, the amp simulates the sound of the speaker, so you get the full experience even through headphones. But the real advantage of a regular guitar amp, whatever the brand, is that you can just plug in and play. Whenever I start using iOS amp apps, I get amazing sounds, but I also end up deep in the rabbit-hole of tweaking and playing. That’s my own nature getting in the way of things though, so when I just want to play, I use the amp. When I want to play with sound, or when I’m traveling, I use the iPad hooked up to the next marvel on our list, the iLoud. The iLoud is an incredible device. It’s a stereo Bluetooth speaker with a built-in iOS guitar interface. You plug your guitar into the back (there’s a full-sized jack socket), then plug your iPhone or iPad into another jack and fire up your amp app of choice. Then crank it. The iLoud lives up to its name. The little box sounds huge. Guitars don’t typically need much bass (guitar amp speakers are designed to minimize low frequencies), as that’s provided by (you guessed it) the bass player. But the iLoud has plenty anyway, and when you’re playing alone your sound will really sing. It’s also battery powered, so you can travel with it, and you could even busk. And because the iLoud is designed to be used as a guitar speaker, you should leave the virtual speakers running inside your apps. Two important points: the Bluetooth is for listening to music only. It can’t be used for anything to do with the guitar amp part of the setup – everything is wired, which keeps latency nice and low. The second point is that the built-in iOS connector is analog, and gives the same noisy connection as any other analog interface. I use my iLoud with the Sonic Port instead, and it works just great. I have one of these on order. 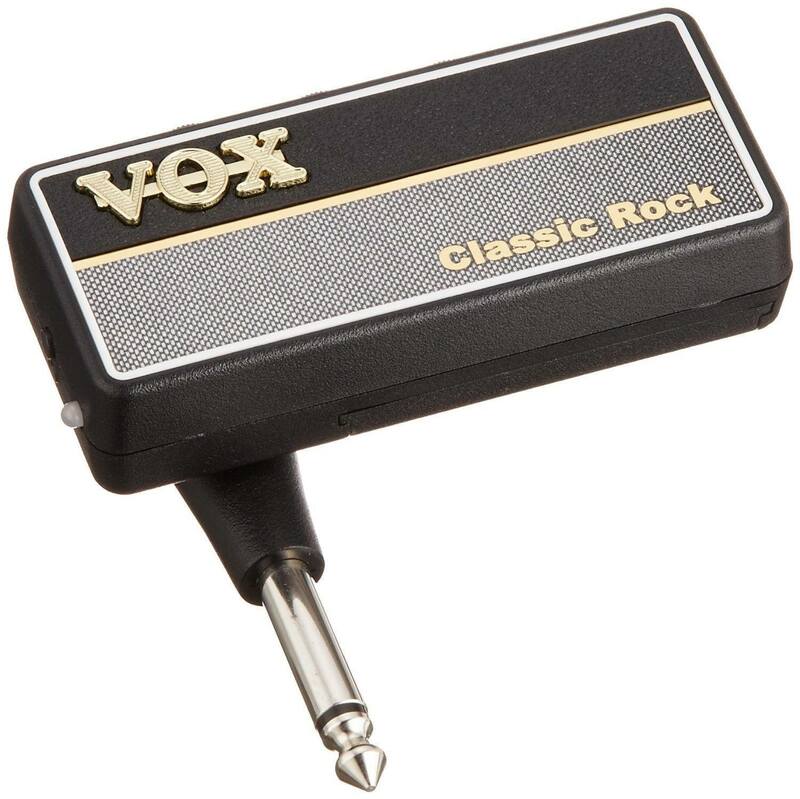 Vox’s Amplugs are mini amplifiers that plug straight into your guitar, letting you practice with headphones, and without the trail of wires needed to hook up an adapter, an iPhone and everything else. You plug the tiny box straight into the guitar’s jack socket, then plug your headphones into the Amplug. There’s a volume control, buttons to add a few effects, and a gain dial to adjust the amount of crunch. I’ve even heard of people who like the sound so much they use the Amplug as a full-time amp. Hooked up to speakers. While playing a gig. The advantage here is convenience. It’s perfect for sitting on the couch and playing while other people watch TV. There’s a new version coming out in a few months called the Amplug I/O, which doubles as a digital iOS interface, as well as a tuner. That’s not here yet though, and the price will be around $60, which puts it at double the cost of the current models. As an all-in-one though, the new I/O looks difficult to beat. It’s hard to exaggerate how good things are for news guitarists today. You can pick up an amazing guitar like my Squier Telecaster Classic Vibe for under $400. Add the $20 iRig to your order, download JamUp and you’re ready to go. YouTube is a fantastic resource for all guitarists (start with Justin Sandercoe’s JustinGuitar site for some of the best lessons around, and free), and the quality of music resources on the web is absurdly high in general. Way better than your bass player’s theories on, well, on anything. You know how bass players are. But maybe the best part of all this is that you can try out many different amps and pedals for a fraction of the cost of the real thing, and in many cases with quality equal to the real thing. I’m no pro musician, but I know that I’d much rather have an iPad packed with amps and effects than own a single giant amp that I could never crank up anyway, because my neighbors would just call the police on me. And when I do come to buy new hardware, I’ll know exactly what I want, because I’m testing it out on my iPad already. Charlie writes about gadgets and apps, and runs a secret gadget test lab in former East Germany. You may recognize him from Wired.com’s Gadget Lab, or from his gig as the Reviews Editor for Cult of Mac. He also edits Straight No Filter, a pretty amazing site about mobile photography.